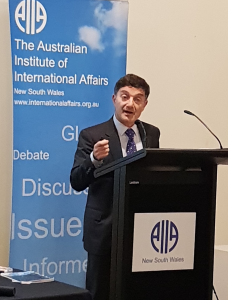 On Tuesday 27 March the Institute hosted Professor Steven Freeland, an international authority on international and human rights law, Australian representative on the UN Committee on the Peaceful Uses of Outer Space, and Dean of Law at Western Sydney University. He dealt with the development of legal principles for outer space, building on the principles the law of the sea and International Humanitarian Law (governing armed conflict). Given the renewed business interest in space, due to events such as Elon Musk’s SpaceX program and Richard Branson’s premature plans for space tourism, questions are once again being raised as to what measures the international political community should adopt towards space in the broader context of state interests and the long-standing principles of open access to common goods. One of the critical points made by Professor Freeland was that, although the space age of the 1950s to 1970s brought a plethora of treaties on the regulation of outer space, international law regarding space has become outdated. Technology has vastly outpaced the growth of law aimed to govern it, and thus the international community faces difficult challenges in establishing a legal framework to appropriately deal with the increasing actors, both state and non-state, who wish to stake their claims in this new frontier. Space debris was an increasing problem. Society has become increasingly dependent on space and satellite technology, yet the forty-year old treaties governing space left growing areas of uncertainty. Major beneficiaries of space-related technological gains have been states’ militaries, which have approach this legal dilemma with the outlook of ‘if it’s not expressly prohibited, then it is permitted’. Professor Freeland detailed how space has subsequently become a new battleground for state military engagement, with satellite technology, GPS and satellite guided missiles a common accessory of the modern state’s arsenal. China’s shooting down of its own satellite demonstrated that earth-to-space offensives were now a real prospect in warfare. This had contributed to a renewed focus on the need for a legal framework in international law to apply to the use of outer space during armed conflict. Given Professor Freeland’s talk, and with the announcement of Australia’s intent to establish its own space agency, it is clear that the frontier of space could soon be central to Australia’s foreign policy.